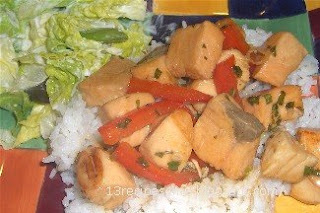 Cut salmon fillet into one inch cubes. Toss with oyster sauce, salt and pepper. 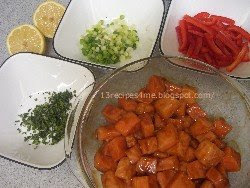 Marinate 20-30 minutes. In skillet, heat oil, add salmon and cook over medium high heat. Turn gently, cooking until nearly done, 5-6 minutes. (If you cook too long or stir the pieces around too much, you will end up with little shreds.) Add green onion, red pepper, white wine, & water. Cook another 2 minutes. Stir in fresh chopped basil and squeeze 1/2 lemon over all. Add salt and pepper if desired. Serve over steamed rice. Next time, I will probably add additional veggies. I have never had salmon. Does it taste like tuna? Or chicken? Fish is intimidating for me, I'm so afraid I won't cook it thoroughly. I always struggle with that and am always asking, "Did I get it done enough?" Needless to say, I like my steak very very well done. I'm with you Ann. I like my steak well done. My husband and kids mostly like medium rare. Tricky. When I cook fish, I often cook it until it is so flaky it falls apart. Doesn't really bother me a bit. In fact, it is quite tasty, lol.